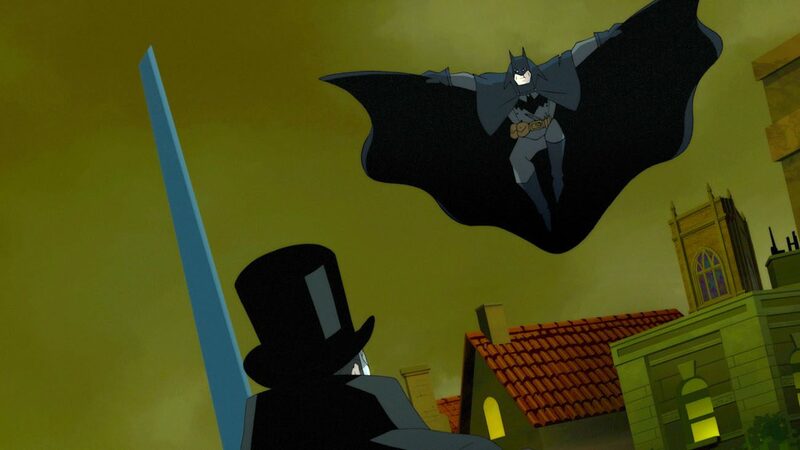 NEW YORK (CNS) — Catholics who view the direct-to-video animated film “Batman: Gotham by Gaslight” (Warner Home Video) may take a particular interest in one character, a nun named Sister Leslie (voice of Grey DeLisle). Facing a deadly threat, she gives brave witness to the power of Christian forbearance. It’s a brief moment of grace in what is otherwise an adequate — but by no means outstanding — superhero tale. Bloodletting, nongraphic sexual elements and a bit of foul language indicate this title is best for an audience of grownups. The movie is based on the 1989 graphic novel by Brian Augustyn and artist Mike Mignola, Set in a Victorian-era version of its title city, “Gotham by Gaslight” transfers the world of the Batman to turn-of-the-last-century America. As in more recent contexts, socialite Bruce Wayne (voice of Bruce Greenwood) patrols his home town by night in the guise of his alter-ego, Batman. His current target is Jack the Ripper, who has been murdering prostitutes, just as his real-life counterpart did in London. Police Commissioner James Gordon (voice of Scott Patterson) is, as always, a step behind the latest developments in the case. And complicating matters is Gotham’s role as host of the World’s Fair, which has brought crowds and rides to the city’s center. The antipode to Jack is Sister Leslie, who is the merciful response to the Ripper’s hate. Whereas Jack sees orphans, immigrants, anarchists and other outsiders as a dirty contagion infecting the urban environment, Sister Leslie transforms the lives of these same people with love. She helped raise Bruce Wayne after his parents were killed, giving his young life direction. “She takes in all of the helpless and the homeless,” offers Selina Kyle (voice of Jennifer Carpenter). In keeping with the period setting, Selina, also known to comic book fans as Catwoman, has exchanged her sleek modern costume for a dress. But she still wields her trademark whip. The Ripper sees Sister Leslie — who sadly admits that, when it comes to helping sinners, “you can’t save them all” — as an enabler of prostitution and degeneracy. A psycho obsessed with germs and contamination, Jack believes it’s better to kill the ladies of the night, and cleanse the city, rather than fail at rehabilitation and allow the virus back on the street. With this in mind, Jack sets out to stop Sister Leslie. Confronted by the evil Jack embodies, she offers not violent resistance, but forgiveness. Of course, Bruce Wayne figures out who Jack is. The final battle between the two adversaries takes place atop a burning Ferris wheel at the World’s Fair. The big reveal of the Ripper’s identity is a real surprise that even longtime fans of the Dark Knight may not see coming. Screenwriter James Krieg and director Sam Liu keep things moving along in the 78-minute movie. The animation is good, even if a bit rote — considering the spectacular things that are being done with superhero animation in places like Japan. The voice work is all solid as well, including that of Anthony Head as unctuous Wayne Manor butler Alfred Pennyworth, Yuri Lowenthal as attorney Harvey Dent, John DiMaggio as Police Chief Bullock and William Salyers as warped scientist Hugo Strange. The film contains bloody scenes of murder, sexually suggestive situations involving prostitution, and two instances of crude language. The Catholic News Service classification is A-III — adults. The Motion Picture Association of America rating is R — restricted. Under 17 requires accompanying parent or adult guardian.